Coat a large saute pan with 1 tablespoon olive oil. Add the onions, season with salt and pepper; bring to a medium-high heat. Cook the onions until they are soft and translucent, 4 to 5 minutes. Add the garlic and cook 50-60 seconds (making sure garlic does not burn). Turn off the heat and let cool. In a mixing bowl, combine ground turkey (do not over mix), 1 tablespoon olive oil, onions, garlic, spinach, zucchini, zucchini liquid, salt and pepper. Shape into patties. Grill or sauté burgers on medium heat until internal temperature reaches a minimum of 165 degrees F.
Place all of the ingredients in a food processor and blend until creamy. Transfer crema to a small bowl. If not using immediately, press a sheet of plastic wrap onto the surface and refrigerate for up to 2 hours. 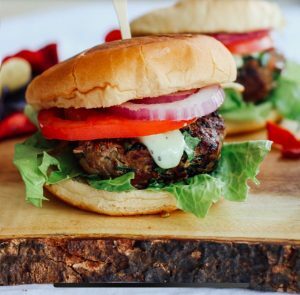 Adding spinach and zucchini to the burgers is a great way to get kids to eat the "green stuff"!